This 1974 39x44mm. 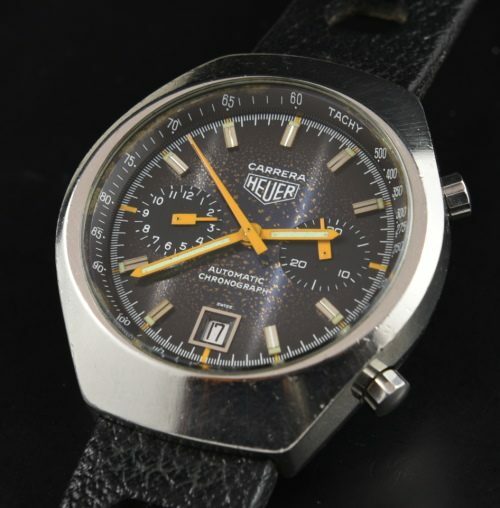 HEUER CARRERA is a very uncommon version in the Carrera.I think these dials are the among the best looking in the whole Carrera line. This ORIGINAL Lmetallic dial is AMAZING! Heuer designed this dial to have 3 sections and the slight angle catches the light and creates all kinds of magic as you tilt it on different angles. The aging even makes this dial more fantastic. The handset is original. The case is unpolished. The crown and pushers are original. The mineral glass-great shape. The caliber 12 was meticulously cleaned and operating perfectly. This is a very uncommon watch.